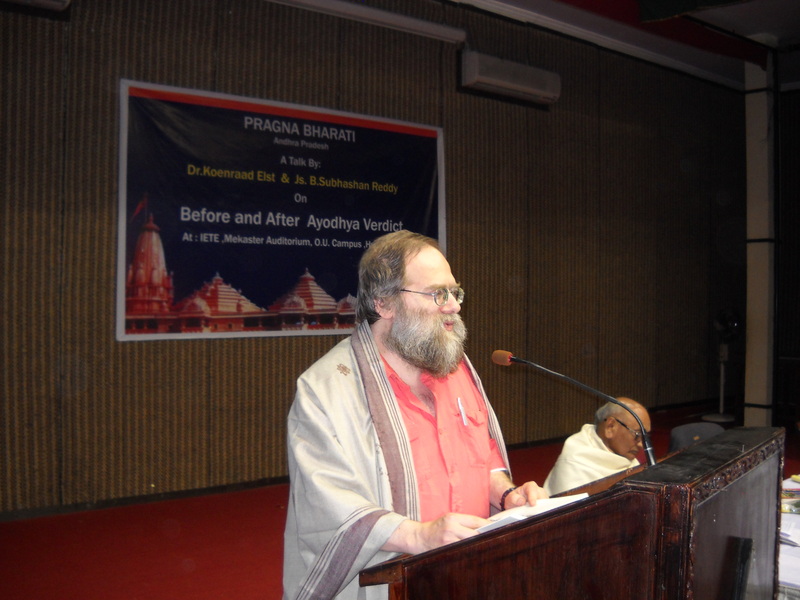 “The entire ayodhya issue was unnecessarily complicated by some JNU Historians and some vested political interests and the matter could have been well settled by long standing Hindu belief, which was not harming anyone” said noted indologist Dr.Koenraad Elst. Delivering his speech on the topic “Ayodhya verdict: Before and After” in a seminar organized by Pragna Bharathi here in Hyderabad, he made the above comments. Tracing out Ayodhya’s history and its significance to Hindus, he said that as per Hindu beliefs, Ayodhya was built by Manu and as opined by Megasthanese the approximate age of the same would be around 6776 B.C as it coincides with the end of ice age. Rama was born in the same city and revered till date by all Hindus. He cited some Budhist texts too to espouse the same in which it is stated that Rama was an earlier incarnation of Budha himself. In the process he vehemently rebutted the utterly false and baseless Marxists theory, propogated by Praful Bidwai and his bandwagon, that Budha was a revolutionary against the brahmanical dominance. Commenting on the importance of protecting Ayodhya, he said the most recent history of Ayodhya as agreed by the Marxist historians dates back to Vikramaditya period, which is more than 2000 years old and good enough to confirm a place as sacred and respectable. Comparing the sanctity of Ayodhya with those of Jerusalem and Mecca, he said Holy sepulcher Church in Jerusalem was built by demolishing a local Aphrodite temple just because the mother of Constantine dreamed that Jesus was buried at that very place. The case for Mecca is even worse as it is believed that Adam made it his abode after being expelled from paradise. “When these beliefs were never questioned and the Govt sponsors the pilgrimage to these places, why do Hindus need to prove their beliefs that are older than those of other faiths’?”, he questioned. Moreover, Ayodhya has no meaning for Muslims whereas it has a lot for hindus and this should solve the issue. Jumping from 1886, in which year the then British magistrate conceded that it was in fact Ramjnmasthan, to 1986, Elst said that much against the popular belief in the media that the movement was reinitiated by BJP, the case was in fact reopened by Rajiv Gandhi led Congress government. At one time, Elst opined, that Congress was keen to build ram temple there as a measure to balance appeasement after being haunted by Shahbano case ramifications. Dr.Elst felt that the entire Ayodhya movement threw an opportunity to explore into the Islamic iconoclasm but unfortunately there were no takers for this angle. He found serious errors of facts and judgment in the recent Ayodhya verdict when judges said that building a mosque by demolishing a temple is against the basic tenets of Islam. Dr.Elst said that Islam indeed has doctrine to demolish temples and build mosques over them. To buttress his point, he cited 15th century sufi saint Shamshuddin Araki’s vandalism Kashmir amongst many others. He concluded his speech by offering a solution and that is to free the Muslim community from Islam. Talking earlier in the meet, Justice Subhashan Reddy said that it is quite unfortunate that a matter of this kind has appeared before the court and opined courts are performing appropriately. He said, The Supreme Court, which sent back the appeal before it in 1994 to Allahabad high Court will now take up the issue and will surely take all the observations made by Allahabad High court into consideration before delivering its final verdict. The seminar was organized by Pragnabharathi, Hyderabad as part of its regular intellectual meets and was presided by Dr.Hanuman Chaudhary, former IT Adviser to AP government and attended by more than 150 people from the city. This entry was posted in Hindutva, History, Nation on January 10, 2011 by arisebharat.